Scripophily.com is offering authentic cancelled 100 year $1000 bonds issued by the New York Central Railroad Company and the New York Central and Hudson River Railroad Company in 1913. Both of these bonds are engraved by the American Banknote Company and have a vignette (picture) of New York City's Grand Central Terminal in 1913. 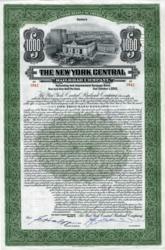 Scripophily.com®, the Internet’s largest buyer and seller of collectible stock and bond certificates, is offering authentic cancelled $1000 bonds issued by the New York Central Railroad Company and the New York Central and Hudson River Railroad Company in 1913. Both of these bonds are engraved by the American Banknote Company and have a vignette (picture) of New York City's Grand Central Terminal in 1913. They were issued for the duration of 100 years and were due and payable in October 2013. The New York Central Railroad, founded in 1853, was a railroad operating in the Northeastern United States. Headquartered in New York, the railroad served most of the Northeast, including extensive trackage in the states of New York, Pennsylvania, Ohio, Michigan, Indiana, Illinois, and Massachusetts, plus additional tracks in the Canadian provinces of Ontario and Quebec. 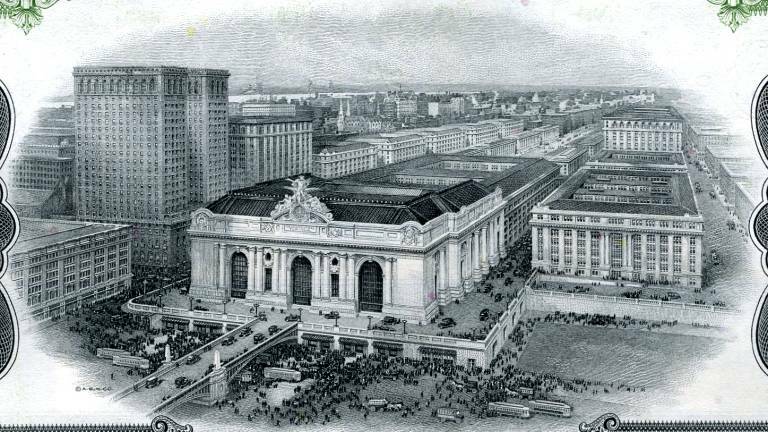 The main connecting point and showcase terminal of all of their lines was Grand Central Terminal in New York which opened in 1913. “We are extremely happy to offer these authentic bonds for sale based on their beauty and historic significance” said Bob Kerstein, CEO Scripophily.com. “We acquired these bonds many years ago from the Penn Central archives and they have been extremely popular to collectors and historians” Kerstein added. Scripophily.com - The Gift of History is the internet’s leading buyer and seller of collectible stock and bond certificates and has had items on loan for display in the Smithsonian’s Museum of Financial History in New York. The company has been featured on CNBC, USA Today, Associated Press, Reuters, Nightline, Today Show, Baltimore Sun, and Washington Post and in many other media publications. The company also offers an old stock research service at OldCompany.com and offers high resolution scans for publications. Scripophily.com has over 17,500 selections including rare autographs and manuscripts.